Our traffic police have apparently gone hi-tech, if recent reports of their intent to use drones to monitor traffic are to be believed. 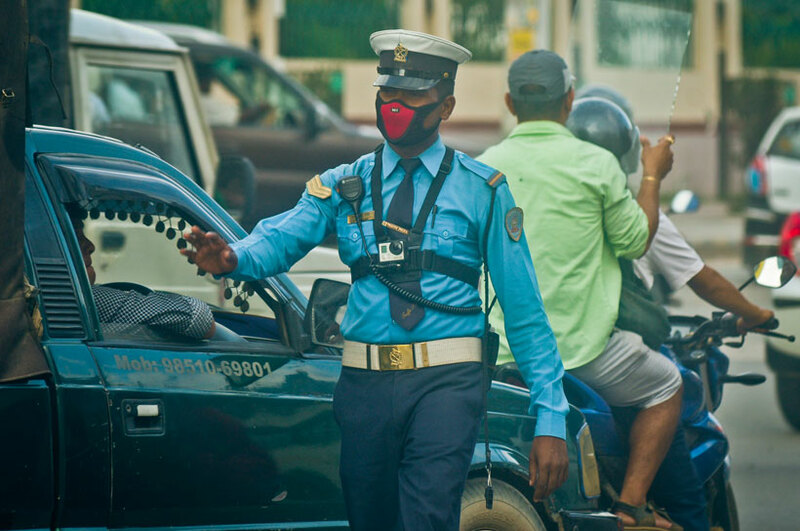 To be honest, this publicity gimmick – that’s what it really is – was just a question of time because our traffic police, despite their bureaucratic make-up, have been quick to adopt progressive technology. 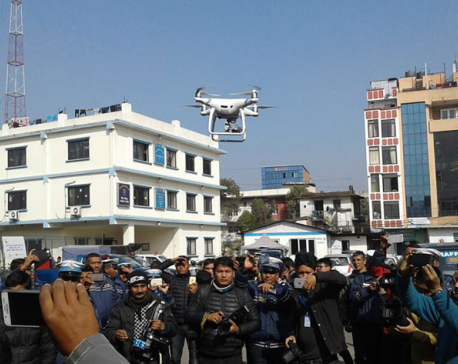 First it was CCTV surveillance (more on that later), then mobile phone applications, ‘Go Pro’ cameras, and now drones – or rather a single drone. At this exponential rate of progress, they might soon be launching their own satellite into space. But jokes aside, this continuing embrace of technology has mainly been in the form of token gestures and doesn’t really do the police or the public any good. It would be more productive if it were done sustainably for the long term because these tech experiments, which are sporadically adopted with much fanfare and then disbanded soon after without so much as a whimper, are far too short lived. Honestly, a full charge of the battery on my smartphone has lasted longer than some of these initiatives and given the age of my phone that is saying a lot. This drone issue really got my goat partly because I spent the first few days of 2017 in the police station having unfortunately been caught up in an accident at Maitighar Mandala through no fault of my own. I was summoned to the police station a few days later and I had to plead, scream, threaten and use other ‘resources’ just to get the ‘police, my friends’ to retrieve the CCTV footage of the incident. All the while I was actively discouraged from it (even though it would have proved my innocence) even though you’ll find the cops banging on about their ‘CCTV’ capabilities in all of their publicity materials. Now, you would think that an accident-prone spot like the Mandala would be covered by CCTV cameras. After all, most of you would have been to one of those lane discipline classes which the police seem to run with movie like frequency and timings (three or four shows daily) and would definitely remember the graphic CCTV grabs that they keep showing you. Although I could write a book on what transpired thereafter, to cut a long story short there was no footage because the camera was facing the other way. Needless to say, the conclusion to the story was a low-tech old-fashioned compromise that involved me unjustly paying up because I couldn’t handle all the stress and finger pointing. So much for technology and its role in ensuring fairness and justice. It’s not like all the tech-associated initiatives the cops come up with are ineffective. On the contrary, most of their efforts are quite bang on – they have deterred drunk driving, curbed lane indiscipline and assorted infractions and forced taxi drivers to keep on the straight and narrow. While we may have our gripes with the system used to coerce our conformity, aka the over reliance on fines, many of us will attest to the impact it has had on the traffic flow and discipline. But that impact has been largely due to low-tech physical presence and not due to the high-tech gizmos that the police have adopted at any given point of time. ‘Ma pa se’ is still checked by the police making small talk up close and personal while they smell for signs of alcohol consumption. Lane indiscipline is countered through the presence of the traffic policemen doubling up as human road dividers. Leave the ‘Go Pro’ on a stick and you’ll find most people flouting discipline due to lack of police presence. Our errant taxi drivers are usually often sorted out through on the spot interventions and not through the traffic application. I’m not saying we should expect the cops to live in the stone age, and go about their business without incorporating technology, but what’s the point of fanciful technology if it is not sustainable. A case in point is the smart driving licenses that were issued in Kathmandu without the police getting card readers to check and verify information or the myriad problems in data storage and modification rendering it impractical. A lot of the time we find corporate houses will either collaborate with or will be seen to be assisting the police as part of their ‘Corporate Social Responsibility (CSR)’ but, in reality, are just using the occasion to blow their own trumpets. A visible illustration of this is in the road traffic signs where the corporate logo takes up half the space and the traffic message ends up being relegated to second place – in some instances reading like the fine print on your insurance contract. The focus of assistance and support should be on long-term solutions and not the adoption of pretentious technology just for the sake of it. The public would be better served through investment in long term solutions and sustainable services – like a training centre to show all of those videos instead of the UNICEF tents the cops currently use, more cameras at accident hotspots, repainting zebra crossings etc. There is just so much more that can be done to help the police render their duty better instead of token gestures that seem to be the norm. The ever-increasing vehicle registrations and resulting traffic congestion means that it’s going to take more than one drone, a few ‘Go Pros’, and barely functioning CCTV cameras for the police to do their duties effectively. It’s time our police became smarter with their investment in and adoption of technology.